An art quilter's search for the light switch. While I may be searching for the light switch regarding art quilts, I find that the history of quilts is also illuminating. A couple weeks ago I attended the American Quilt Study Group seminar in Cherry Hill, New Jersey. There, my friend and colleague Barbara Schaffer and I presented a study center on "The Characteristics of New Jersey Quilts", based on our previous book, New Jersey Quilts: Contributions to an American Tradition. We also led a round table luncheon discussion on Florence Peto, the subject of the recently published A Passion for Quilts, which I co-authored with Barbara, Rita Erickson, and Natalie Hart. The first night was an "ice breaker" where lots of quilts were exhibited, including two of mine: The Presidents Medallion and Mannahawkin Album. ﻿One of my favorites was a Hexagon/Mosaic quilt belonging to the Burlington County Historical Society. Talk about fussy cutting! There were vendors with lots of wonderful things (including a quilt that came home with me), a silent auction, and a live auction. The paper presentations ranged from WPA projects to tivaevae from the Cook Islands; all well researched and well presented. And there was lots of networking. A Passion for Quilts flew off the shelves. 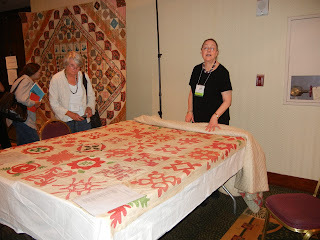 If you want to learn more about AQSG, check out their website http://www.americanquiltstudygroup.org/. To see more pictures from the seminar, have a look at Barbara Schaffer's blog http://www.barbaradschaffer.blogspot.com/ and at Barbara Brackman's blog http://www.barbarabrackman.blogspot.com/. 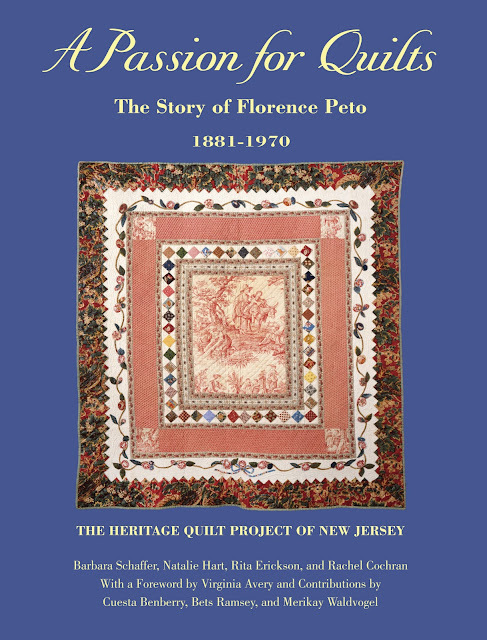 If you'd like to know more about The Heritage Quilt Project of New Jersey, go to http://www.newjerseyquilts.org/ where you can also order a copy of A Passion for Quilts. 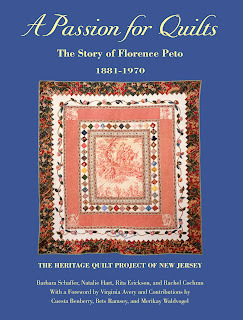 For those of you wondering what I have been up to all summer (and for many years before), I am very excited to announce that The Heritage Quilt Project of New Jersey has just published A Passion for Quilts: The Story of Florence Peto, which I wrote with co-authors Barbara Schaffer, Natalie Hart, and Rita Erickson. The four of us previously co-authored New Jersey Quilts: Contributions to an American Tradition, published in 1992, and once again teamed up to continue our quilt research to learn more about Florence Peto (1881-1970). Florence Peto was a quilt collector, quilt historian, and quiltmaker. The quilts she collected and those she made were of such high quality that they became significant parts of museum collections. Florence's enthusiasm for life, thirst for knowledge, and love of quilts led her on a path she might not have expected as a young woman at the end of the nineteenth century. Through books, magazines, lectures, and exhibits, she shared the stories she found in quilts and created a legacy that endures from the twentieth century into the twenty-first century. The book is 174 pages with more than 150 illustrations, including family photos and previously unpublished quilts. In addition, we are very lucky to have a foreword by Virginia Avery and contributions by Cuesta Benberry, Bets Ramsey, and Merikay Waldvogel. If you'd like to order a copy, send a check payable to The Heritage Quilt Project of New Jersey in the amount of $32.95 plus $5.00 for shipping and handling to: The Heritage Quilt Project of New Jersey, P.O. Box 341, Livingston, NJ 07039. Or you can go to the website http://www.newjerseyquilts.org/. I recently visited our local historical society to see the quilt collection. I had seen the quilts before, but this time shared the visit with a quilt-loving friend. Here's a quick look. This is a wonderful broderie perse/applique with lots of fascinating blocks. Many signatures and a date of 1844. ﻿Here's a close-up of the gorgeous Prussian blue setting strips. I loved the simplicity of this design. As is often the case, it's the fabric that transforms the simple design. The copperplate fabric of this quilt is called "Fortune of War" because of a tavern sign. It also features a two-story building with a British flag hanging from the window. Tricky to get a good photo. This vibrant feathered star was made in the 1840s. ﻿Rising Sun quilt with broderie perse. I also have an interest in mourning pictures. Here is a pretty spectacular one. Hope you enjoyed the brief tour. This post has been delayed more than I would like because I've been working on a book! But more about that another time. Earlier in the spring--if we actually had a spring here in NJ, and that's questionable--I was admiring my newish hedge of skip laurels in bloom. I noticed a nest on one of our fence posts. Not a great spot, thought I, so I tried my best to keep an eye on it. First it was empty. Then there were two eggs. The next day there were three. And the next day there were four. Things were getting crowded. But then several days later, mother robin had done her job of protecting, and four little hatchlings appeared. And now the nest is empty. Another robin has now built a nest on top of the floodlight fixture over the garage doors. More tweets soon to come. On Saturday I spent a lot of time looking at quilts. First, I went to the American Folk Art Museum, Lincoln Square Branch, to participate in a quilt demonstration along with several other guilds in the metropolitan area. I was officially part of a somewhat unofficial though long-standing group lately christened the Montclair Late Night Quilters. We were the only group from NJ. Represent! Then I headed over to the Park Avenue Armory to see the wondrous exhibit of red and white quilts. Along the way, I had a chance to see the flower sculptures along Park Ave.
﻿Then into the Armory, which in itself is a fantastic building. The exhibit was, indeed, a "veritable wonderland" of infinite variety. Six hundred and fifty red and white quilts displayed in a manner so unique it took your breath away. The quilts glowed. ﻿Most of the quilts were pieced or appliqued. Interestingly, I counted about three in which the red was not a solid color. And there were also some quirky ones, including one of my favorites, an embroidered top, which I need to do some looking into (I didn't use either the iPad or iPhone app). For the moment I am referring to it as the "Smith Brothers" quilt due to all the men with beards. Although given all the exotic animals included, it could almost be a reference to an exploration, with maybe a Livingstone or Stanley pictured. A close-up shows some interesting period dress. If you have any opportunity today or tomorrow to see this exhibit, go, go, go! This was a wonderful gift to New York City from Joanna S. Rose in celebration of her eightieth birthday﻿. Thank you Mrs. Rose! Yes, it's been one of those winters here in New Jersey: record setting. I have lost track of how many snowfalls we've had since Boxing Day, but at some point, things were starting to melt. And even though these icicles were the result of over-taxed gutters, there was hope that the snow would soon disappear. Alas, that was not the case. More snow came, and more is to come. Sigh. I know what Shelley wrote still holds, "If winter comes, can spring be far behind?" but he's not doing the shovelling. On a journey from traditional quilt making to contemporary art quilting, experimenting along the way.